Regular readers of CWBChicago have seen many examples of criminals being charged with violent crimes while being on parole or probation for other violent crimes. Today, we may have one of the all-time best (or is it worst?) examples of Cook County’s revolving door justice system. It involves one of the two men arrested Sunday after two 7-Eleven stores were robbed in Lincoln Park. The men are suspected in at least six other convenience store robberies on the North Side in the past week, according to police. Incredibly, in less than eleven months, one of the accused men has managed to “serve” two 18-month prison sentences, get paroled, and get arrested for robbing convenience stores while allegedly using a vehicle that was taken in a carjacking. Today, 23-year-old Tyler Oates and 20-year-old Vontez Turner were each charged with one count of felony armed robbery with a firearm and one count of robbery. They were due in bond court this afternoon. Oates and Turner were arrested after they encountered police who were waiting for them to return to their getaway car after robbing a 7-Eleven store in the 1300 block of West Fullerton around 7:30 a.m. yesterday, according to a police report. 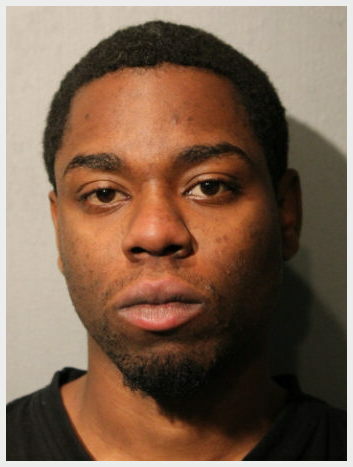 The two are also charged with robbing a 7-Eleven at 2004 North Halsted with a handgun less than 20 minutes earlier. Police said the getaway car that had been left idling behind the store was taken in an armed carjacking in the 2900 block of North Spaulding on Nov. 1st. The vehicle was said by a police officer on-scene to be “filled” with 7-Eleven merchandise. Neither Oates nor Turner is charged with possessing the stolen car. A third man who participated in the robberies remains at large. January 10, 2018: Arrested and charged with robbing a man four days earlier in the victim’s garage in suburban Melrose Park. Taken was cash, credit cards, a phone, and jewelry. Turner is charged with felony robbery and felony burglary. He’s ordered held without bail. Jan. 2018: Grand jury returns eight felony weapons counts against Turner in connection with the handgun incident. Feb. 1, 2018: Grand jury returns eighteen felony counts including vehicular invasion, burglary, robbery, and identity theft in connection with the Melrose Park case. Oct. 9, 2018: Released from Stateville on parole after “completing” his gun and credit card sentences. • 6400 Block of West Diversey Ave. on Nov 5, 2018 at approximately 3:45 a.m.
• 2600 Block of North Clark St. on Nov 11, 2018 at approximately 5:20 a.m.
• 1300 Block of West Fullerton Ave. on Nov 11, 2018 at approximately 5:30 a.m.
• 2000 Block of North Damen Ave. on Nov 11, 2018 at approximately 5:45 a.m.
• 3600 Block of West Belmont Ave. on Nov 12, 2018 at approximately 5:15 a.m.
• 3000 Block of North Pulaski Rd. on Nov 16, 2018 at approximately 4:20 a.m.
• 4300 Block of North Kimball Ave. on Nov 16, 2018 at approximately 5:10 a.m.